By Alistair Reign, July 8, 2016. (updated 4:55 PT). Alistair Reign News Blog. Micah Xavier Johnson was the lone gunman in the rampage. (Photo: Twitter). Current: An American army veteran has been identified as a – lone – gunman in the Thursday Dallas police shooting. Dallas Mayor Rawlings confirmed today what law enforcement officials had told NBC News earlier, Micah Xavier Johnson was the lone gunman in the rampage. 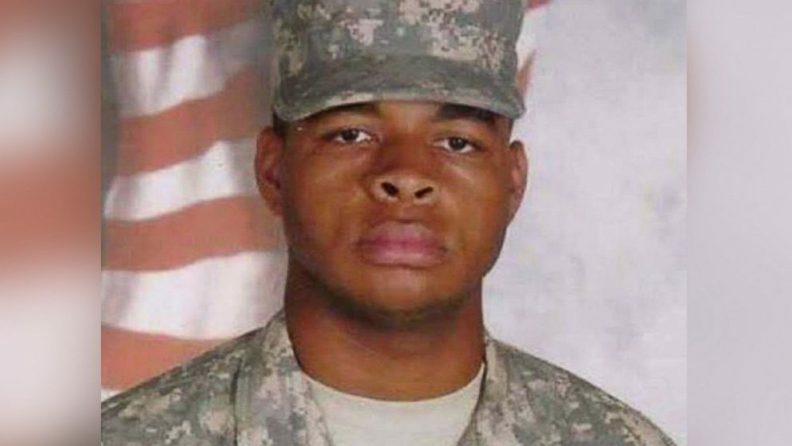 The killer – Micah Xavier Johnson was the man reported as being killed by an explosive device attached to a robot after talks broke down. “He was laughing and singing and not at all anxious during the standoff,: a source told police. The investigation into Johnson’s attack is still ongoing, and much remains is still unknown. But a picture is beginning to emerge of what went on inside the standoff — a source tells NBC Investigates that the 25-year-old was wounded by gunfire before being killed by a robot outfitted with a bomb — and how he prepared for the deadly assault. “This was a mobile shooter that had written manifestos on how to shoot and move, shoot and move, and he did that. He did his damage,” Mayor Rawlings said. Officials told NBC News the investigation so far has yielded no additional suspects that may have played a role in the shooting. Texas Gov. Greg Abbott said Friday that there is no information about additional co-conspirators, but if any are found, they will be brought to justice. Sources tell NBC News they have found no ties between Johnson and any extremist groups so far. [01 a] (End update). Five police officers were killed and seven others injured when snipers opened fire late Thursday during a protest against two fatal shootings of black men at the hands of police. Two civilians were also wounded. Three suspects are in custody, while a fourth was killed by a police-detonated explosive. Yesterday hundreds of people had gathered peacefully in Dallas to protest police shootings of two black men this week, Alton Sterling in Louisiana and Philando Castile in Minnesota, said the Dallas Police Department. According to the DPD, there were 100 Dallas officers on the scene for the demonstration. It was Thursday, about 8:45 pm. Gunfire began as at least two snipers fired on police from elevated positions. A little over four hours later, it was Friday 12:30 am. Dallas Police said at a news conference that three suspects — two men and a woman — were in custody. The two men were taken in after one of them was seen carrying a camouflage bag and walking quickly down Lamar Street in downtown Dallas. The individual then threw the bag in the back of a Mercedes and sped off. Police followed the vehicle and performed a traffic stop. The woman was taken into custody in the vicinity of nearby, El Centro parking garage. The killing of five Dallas police officers in a sniper attack Thursday, which appeared to be racially motivated, is adding uncertainty to the presidential race between Hillary Clinton and Donald Trump. The mayhem in Dallas in which seven officers were also wounded closely followed two high-profile killings of black men by police. 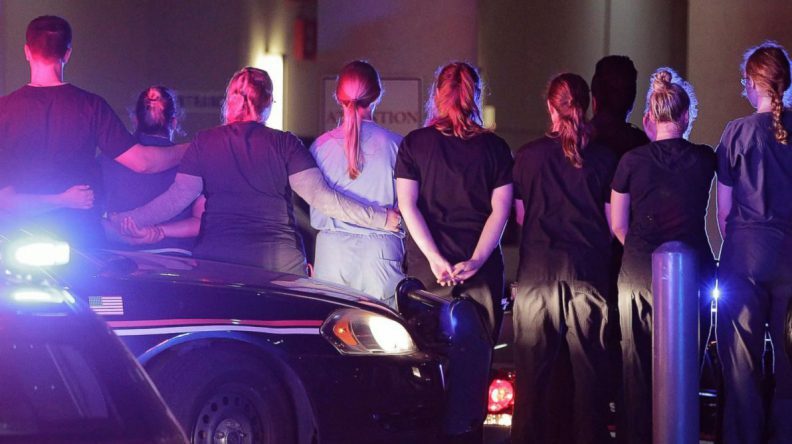 Dallas police officers and hospital staff form a line around the emergency entrance. (Photo: Ralph Lauer/ EPA). “The violence has sparked a nationwide mix of anger and sorrow, as well as fear of what is to come, forcing Clinton, Trump and their surrogates to grapple with finding the right tone in what has been a markedly negative campaign.In a telling sequence of events reflecting the tragedies of the past two days, Clinton and her aides twice rewrote a speech she was intended to give on Friday, where Vice President Biden was initially expected to appear for his first campaign event with the likely Democratic nominee in his hometown of Scranton, Pa.
“Clinton’s speech was first retooled so that she could address the police killings of Alton Sterling and Philando Castile, according to a campaign aide. The speech was then redrafted again after the events in Dallas. “On Friday, the Scranton speech and the event with Biden were scrapped, but Clinton is expected to speak about the events at a historically African-American church in Philadelphia Friday evening. It’s an appropriate setting, her allies say, to discuss the current tensions the nation faces. “Trump canceled a Miami event, which doubled as a tryout opportunity for potential running mate Chris Christie, the New Jersey governor. “The likely GOP nominee also released a statement that was notable because it decried both the violence in Dallas and the killings of Sterling and Castile. “At the same time, an error in Trump’s statement suggested it was done hurriedly. He referred to the two slain black men as motorists, though only one was in a car at the time of the shooting. “Trump’s tone came as a surprise to many, given that he blamed last month’s Orlando nightclub shooting on President Obama and called for his resignation. It was a damaging political misstep for the GOP standard bearer; polls showed a majority of Americans disapproved of his response to the Orlando attack. “This time he followed the traditional political playbook, so much so that his rhetoric about this week’s violence mirrored Obama’s and Clinton’s. “It suggested both campaigns will suspend their political attacks as the nation mourns the fallen police officers. “While both candidates have so far tread carefully, they’ll be forced to confront divisive topics such as gun laws, racial bias in law enforcement and the Black Lives Matter movement in the coming days and weeks. ““You cringe at considering the political ramifications of tragedy, but moments like this do have a focusing effect for voters,” said Democratic strategist David Wade, a former chief of staff to Secretary of State John Kerry. “Trump’s temperament and judgment will once again enter the spotlight, as he’s certain to face questions about whether he’s equipped to deal with national tragedies as president. “But Clinton could also struggle with a divided electorate that’s upset with the seemingly endless string of violence that has plagued Obama’s presidency. “The debate over how to address gun violence again reared its head in the hours following the Dallas shooting. “Obama’s initial response, made in the early morning hours in Warsaw, Poland, generally earned bipartisan praise. But some Republicans took objection to his assertion that the nation’s gun laws may have contributed to the killings. “Former presidential candidate and Trump surrogate Ben Carson blasted those comments during a Friday morning interview on Fox News. ““I guess the real issue is, you know, the president’s gonna start saying, ‘See? Gun control,’ ” he said. “While some Republicans argue that fault lines over race and guns will persist under Clinton’s watch, some Democrats don’t see that being a problem for her campaign. ““On issues of race, in some ways she’ll have it easier and she’ll be able to say things without the immediate assumption” Obama faced as a black president, said Democratic strategist Jamal Simmons. “While many voters have been drawn to Trump’s bumper-sticker slogan of “Make America Great Again” particularly in times of turmoil, Simmons said that the presumptive Republican nominee’s intention is to “bring people back to the Ozzie and Harriet era,” implying that could further turn off young people and nonwhite voters.” .